Your one-stop source for assistance with your post-military transition. Welcome to the Vessey Veterans Resource Center, a comprehensive resource that provides timely information essential to making informed decisions while you transition to civilian life. University of Maryland University College is committed to providing you with convenient access to insights and support from trusted sources. Whether you are looking to secure the right job, understand your veterans benefits, or simply want to know what support is available, the VRC here to help. The VRC is named in honor of a distinguished UMUC alumnus and one of the most accomplished and inspiring military figures of our time, General John W. Vessey, Jr.
About General John W. Vessey, Jr.
General John W. Vessey, Jr.'s military career began when he enlisted in the Minnesota National Guard in 1939. His unit was activated just prior to America's entry into World War II. Vessey's service took him to North Africa, where his unit took a strategic hill near Tunis at a critical juncture in the allied campaign; to Italy, where his unit saw some of the bloodiest fighting of the war; to Korea during the tense aftermath of that war; and to Vietnam, where he was wounded defending a firebase from onrushing Viet Cong invaders for which he won a Distinguished Service Cross. By 1963, Vessey had become a lieutenant colonel. That same year, he graduated from UMUC with a bachelor's degree in military science. He served as vice chief of staff of the U.S. Army from 1979 to 1982, when he was appointed chairman of the Joint Chiefs of Staff by then President Ronald Reagan, making him the highest-ranking military officer in the country. When he retired in 1985 after 46 years of service, he was the longest-serving active member of the U.S. Army. Vessey was a lifelong advocate of education who patterned his own life after a lecture that he first heard discussed in a UMUC classroom. The lecture was "The Five Evidences of an Education," by Nicholas Murray Butler. The General John W. Vessey, Jr. Scholarship Fund, established in 2012, awards scholarships to degree-seeking students in the Undergraduate School and gives preference to Purple Heart recipients, active-duty servicemembers and their immediate families, military personnel who are currently transitioning to civilian life, and students with demonstrate financial need. View our guide for veterans, packed with information to enable a smooth transition. Browse this comprehensive list of services for our veterans. Learn about the Vessey VRC virtual student union for UMUC's military community. Military and veteran students can benefit from peer-to-peer support and mentoring. UMUC's Office of Veterans Initiatives and Outreach helps ensure veterans receive the resources, support, and advocacy they need to succeed in transitioning after the military, earning a degree, and starting a successful civilian career. If you have questions about the resources available in the Veterans Resource Center, or if you have any suggestions about resources to add, please e-mail us at vrc@umuc.edu. Using your veterans education benefits at UMUC is seamless. The dedicated Veterans Certification Office at University of Maryland University College processes your paperwork for education benefits quickly and efficiently, and we work in accordance with federal and state regulations so you can stay focused on earning your degree. After you've followed the steps to apply at UMUC and registered for classes, you'll need to complete the Request for Certification Form through MyUMUC, the online home of your student account. UMUC works directly with the Department of Veterans Affairs to provide information about the classes you're taking. We certify to the VA that you are on track with your program and all courses you're taking are applicable to your degree plan. You can also make changes to your benefits and monitor the processing of your benefits from the Veteran Certification page in MyUMUC. The people you socialize with, attend class with, [and] come in contact with on a daily basis can prove to be the most important asset when you're trying to find a job. Networks cannot only help you find great jobs, they're a valuable resource for helping with your resume. I knew how well [UMUC] worked with veterans from people that I was in the military with. I'd always heard nothing but good things, and I've had nothing but good experiences myself. They'll work with you. 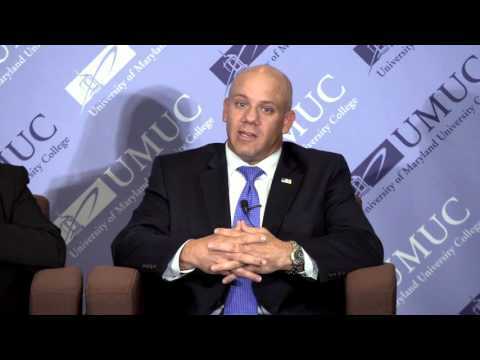 Watch UMUC alum Kirk Clear share tips for veterans on adapting a résumé for civilian jobs. Students can get support and help from Department of Veterans Affairs counselors right here at UMUC. University of Maryland University College is proud to have been selected by the U.S. Department of Veterans Affairs to participate in the VetSuccess on Campus program. VetSuccess on Campus helps veterans transition from military service to college. The program is designed to ensure UMUC's veteran students have the support and assistance they need to be successful in higher education, their careers, and their lives. Services are also available for military personnel, military spouses, and dependents. The student-run VeteransSuccess Club provides an in-person and online community for fellow veterans and their families. An approved chapter of the Student Veterans of America, UMUC's VeteransSuccess Club is dedicated to ensuring that veterans, active-duty servicemembers, reservists, and their family members have a voice on campus and are successful in fulfilling academic, employment, and support needs. For more information e-mail vrc@umuc.edu. Our team of knowledgeable veterans advisors and admissions advisors are at your service. Learn how the Forever GI Bill may impact you at UMUC.